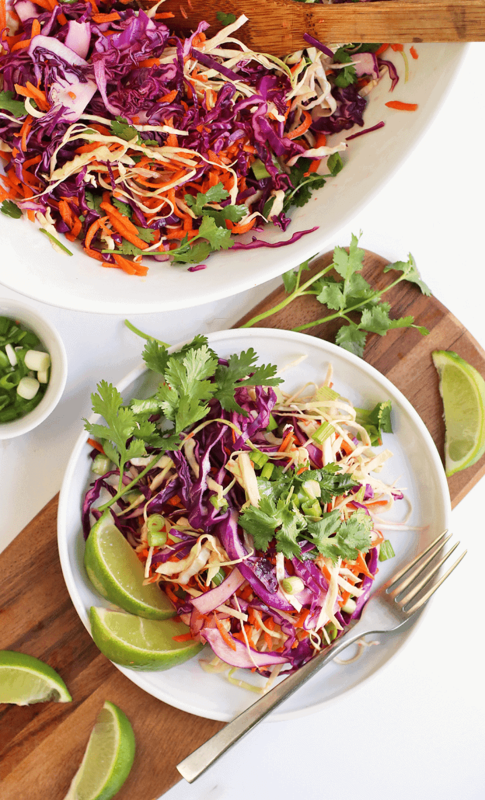 This Cilantro Lime Cabbage Salad is made with shredded white and purple cabbage and carrots then dressed with a sweet cilantro lime dressing. I try very hard to waste no food in my house. To do this it requires a lot of organization (of my kitchen and shopping schedules) and discipline (to cook what needs to be cooked even when I’m not feeling it), but the outcome of zero food waste is extraordinarily worth it. Being a food blogger only makes this more difficult. Every Friday I go shopping to gather all the ingredients I will likely be using for my week’s recipes. This is different than my weekly grocery shopping trip I take every Tuesday to buy food that feeds my family. The challenge with my Friday shopping is that I buy many ingredients that are destined for one recipe and one recipe only. And because I make 3 recipes a week as well as food for my kids and myself all week long, food can sometimes get lost in the depths of the refrigerator. I empty my fridge, determine the foods that are on their way out, and develop a recipe that uses those foods. You may recall my BBQ Chickpea Pizza, one of my most popular recipes last month, that was invented this very way. Well, today I have another recipe that came from the ingredients of past recipes that were in serious need of repurposing. Lots of cilantro and lime from, well, just about every recipe I’ve made in the last couple weeks. 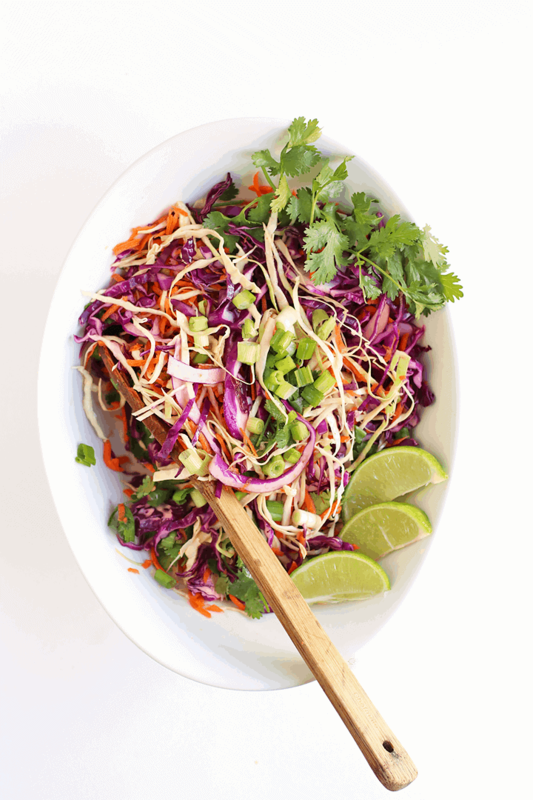 This Cilantro Lime Vegan Cabbage Salad. 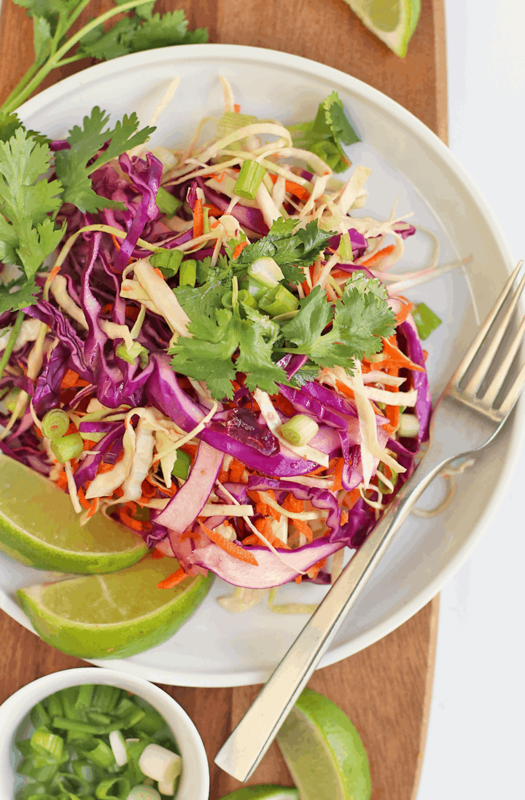 This Cilantro Lime Cabbage Salad is a refreshing side salad that pairs with anything you’re going to be making this summer. Think grill, potluck, picnic, this salad is your constant companion. Plus, it keeps in the refrigerator for up to 4 days for a quick and light snack throughout the day. 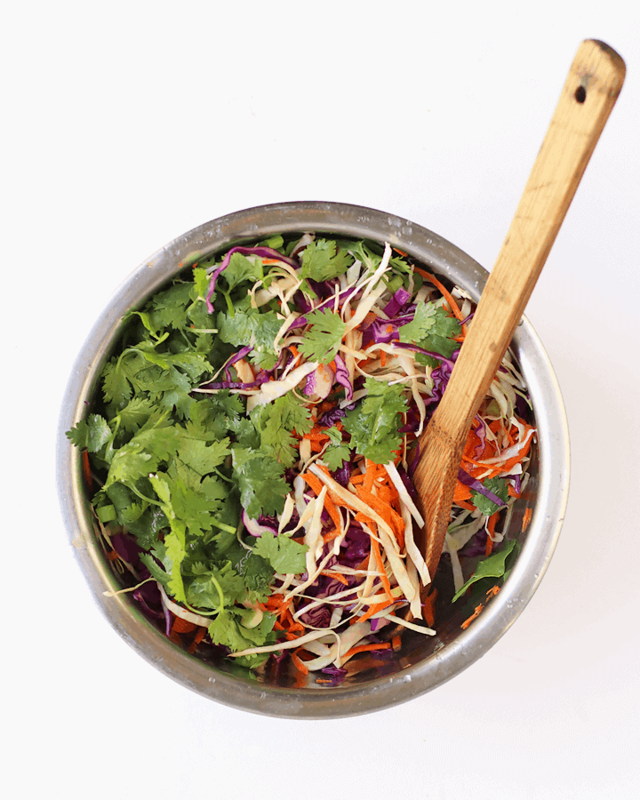 Using a sharp chef's knife or a food processor with the shredder attachment, shred the red and white cabbage as well as the carrots. Transfer to a bowl and stir in cilantro and green onions. In a small bowl combine the ingredient for the Lime Dressing. Pour over the cabbage and toss to combine.